PFC-free reversible waistcoat by SCHÖFFEL. Design ALYESKA 1 with feather-light, warm PRIMALOFT filling, high closing stand-up collar and zip fastener. 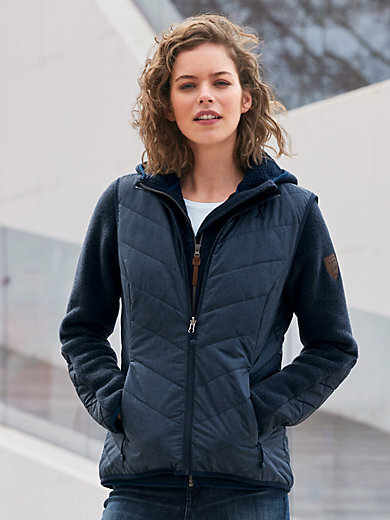 One side is made of slightly textured microfibre and is quilted all-over and equipped with 2 zipped pockets, the other side is made of smooth microfibre with quilting at the back and a zipped breast pocket. The waistcoat can be stowed away in itself thanks to the incorporated pack-away bag. Inside and outside in 100% polyester. Length approx. 26ins. The reversible waistcoat is machine washable.